White Federal style colonial style with semi-circular fanlight in Wiscasset, Maine, ca. 1800. The full scope of the Colonial timeline can be confusing. History is tenuous and selective, if not altogether forgetful, and while most people know the Pilgrims arrived at Plymouth Rock in 1620, you might be surprised to find out that the Pilgrims were not the first people to try and make a home in New England. Colonists settled in Maine first, albeit briefly. As early as 1604, eighty French colonists spent time on an tiny island on what is today the Maine-New Brunswick border. The winter proved to be too harsh, and they uprooted their fledgling settlement and moved to present day Nova Scotia. It is also believed that in 1607 a group of English settlers established a small community on what is today known as Popham Beach. However, following in the footsteps of their French predecessors, these settlers left as well, returning to England after a particularly brutal winter. It was not until after the success of the Massachusetts Bay Colony that the colonists began to arrive in earnest. During the 17th century, these settlers pushed northward into Maine, and this time they stayed. The evolution of a place is easily traced by its styles of architecture, and New England runs the gamut from the modest, First Period Colonial saltbox to the Herculean, four-car garage McMansion. The early American settlers were quick to depart from English building traditions. The Europeans built their homes with a wattle and daub technique. Their houses were built by constructing a woven lattice of wooden strips, and then overlaying the structure with wet soil, clay, sand and straw. The New England First Period Homes had a boxy wooden frame covered in shingles or rough clapboard. The settlers built their new homes with steeply pitched roofs and a central chimney. These houses were modest and austere structures; furthermore, they were practical, as the snow would easily fall off the steep roof and a central chimney was the most efficient way to heat the entire home. Architecture’s Colonial period lasted from 1600-1700. From the Georgian style mansions that dominate the South Berwick area to the classic Federal style homes you find in Kennebunkport, Bath and Brunswick, a scenic drive in New England is like experiencing an open air museum. Every architectural period, revival, fusion and opulent passing fad can be found along the coastal routes or in town squares. Gables and mansards roofs, chimney bracketing, carved swags, projecting porticos, fan windows and Palladian windows are just the tip of the iceberg when it comes to the types of details you will find in New England. From Greek Revival and Victorian to Stick and Shingle and Modern, once you start looking at the houses, you can draw a timeline from 1620 to today. Architecture and design are like modern movies and books, there are the blockbuster homes as well as those that have charming, quaint and original details. What one visitor might find intriguing another person might find ornate, but one thing is certain, you are going to have a difficult time seeing all of Maine’s historic homes. Most of Maine’s historic homes are open from Memorial Day to Labor Day. The Victoria Mansion, in Portland, is an elaborate and grandiose house. It is modeled after an Italianate mansion. Built during the Civil War, the home is overflowing with Victorian ornamentation and decorative arts. You can tour the Victoria Mansion in the summer as well as during the Christmas season. Neal S. Dow is considered the Father of Prohibition. His stately, Federal style brick mansion is in Portland. The house is open year round, but only during weekdays. The Sarah Orne Jewett House is a National Historic Landmark. Located in South Berwick, it is a stately Georgian property. Sara Orne Jewett was an American novelist and short story writer, and the house has been the family since 1819. Sarah and her sister inherited the house in 1887. The home is said to have been Sarah’s inspiration for the novel Deephaven. 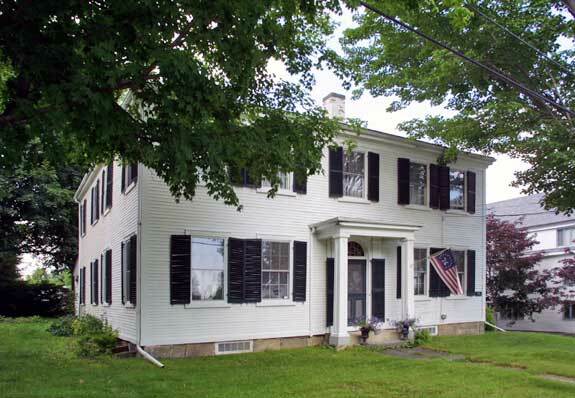 You will also find the Hamilton House in South Berwick. Jonathan Hamilton, a shipping merchant, built this Georgian mansion in 1785. The house sits on a bluff beside the Salmon River Falls. Idyllic and picturesque, the home was later turned into a Colonial Revival country estate by Emily Tyson, a friend of Sarah Orne Jewett. Overlooking the Sheepscot River, in Wiscasset, Castle Tucker was built in 1807. The Tucker family moved into the house in 1858, and revamped and redecorated it to suit their Victorian tastes. It is considered to be one of the finest examples of Victorian-era architecture in New England. Rescued from demolition in 1982 and restored, the Joshua Chamberlain House is a Greek Revival Cape located in Brunswick. Joshua Chamberlain was an American Civil War general and a president at Bowdoin College. Colonel John Black’s 300-acre family estate, Woodland, can be found in Ellsworth. The mansion, built in 1824, is the centerpiece of the property. Built by Captain William Nickels, the Nickels Sortwell House is a stunning example of the high Federal style. Located in Wiscasset, the house illustrates the type of wealth that maritime trade brought to Maine in its heyday. In 1899, Alvin Sortwell, a banker, industrialist and the former mayor of Cambridge, Massachusetts, bought the home. The Ruggles House, in Columbia Falls, is the most well known historic house in Maine. While its elegant Federalist exterior is classic New England, the interior is where you will find the real architectural treasure. The house’s intricate, handcrafted woodwork culminates in a flying staircase. This one-of-a-kind structure takes up one third of the house. If you are in the Bar Harbor area, Columbia Falls is only forty miles north. In addition to viewing a celebrated collection of Maine art at the Farnsworth Museum, in Rockland, take the time to visit the Farnsworth Homestead, which is located adjacent to the museum. Built in 1850, the exterior of the home is an ideal example of the Greek Revival style, and the interior reflects the Victorian tastes of coastal Maine. Constructed in Bethel Hill Village in 1813, the Dr. Moses Mason House is an ideal example of the Federal style. It is said to be the first house on the Bethel Common to have a foundation of granite slabs. At The Washburn-Norlands Living History Center, in Livermore, you can experience the heritage and traditions of rural life in Maine. The Washburn family, a powerful and influential political dynasty back in the 19th century, once owned the mansion house and the surrounding acreage. Today, guided and self-guided tours will give you a first-hand country education. The interpreters in period dress create a memorable and authentic rural experience. The Rufus Porter House and Museum is located in Bridgton. Rufus Porter was a prolific American painter and inventor. However, he is most well known for being the founder of the Scientific American, a magazine that became an outlet for his cutting-edge ideas. Rufus Porter is believed to have taken out over one hundred patents. A wide-range of his scientific memorabilia is on display at this historic house and museum. If exploring one historic house at a time is not enough to satisfy your love of the past, why not rediscover what an entire village looked like back in the early days of America? While historic houses are geared towards the seasoned history buff and the curiously inquisitive, they might not make the most exciting family outing. Snap tables and mahogany sleigh beds can be a bit underwhelming if you have youngsters, as they would rather be spending their day on York Beach, gorging themselves on its world-famous saltwater taffy. However, Maine’s historic villages are interactive destinations. Part living history museums, part throwbacks to a utopian ideal, these historic villages are filled with guided tours, interpreters in period costume and numerous Colonial era activities that an entire family can enjoy. The Willowbrook Village is a replica of a 19th century community. There are historic houses, a bandstand, a reproduction schoolhouse and numerous exhibits illustrating the many crafts and trades of the era. You can learn about canoe building, cobbling, blacksmithing and harness making. Horse-drawn sleighs and regal carriages are on display, and no day at Willowbrook is complete without a ride (or two) on the 1894 carousel. Different events and activities are scheduled throughout the summer. The Sabbathday Lake Shaker Community is the last active Shaker community in the United States. In fact, it still accepts new converts. This 1,900-acre working farm is located outside of Portland. Composed of beautiful, 18th century buildings and a child-friendly farm that has a sheep, Highland cattle and pigs, there is plenty to do and see. However, most people make the trip to get a first hand look at the famous Shaker furniture. The Swedish Colony, in Aroostook County, celebrates Maine’s Swedish history and traditions. From lively, family festivals like Saint Lucia and Midsommer to traditional smorgasbords, the communities of New Sweden, Stockholm, Woodland and Perham keep their Swedish heritage alive in the Crown of Maine. Located in Van Buren, the Acadian Village is the largest historical site in Maine. The settlers from France who landed in Nova Scotia, which was known as Acadia in the 17th century, have roots throughout Maine. This replica village was built in 1976 by the Living Heritage Society to commemorate the Acadian people and educate visitors about their way of life.